In this article we`ll try to generalize our practices in promotion of companies that provide web hosting and domain registration services what can help SEO`s to manage SEO work at sites in this niche. Market analysis and competitive researches. Finding potentially advantageous promotion directions. 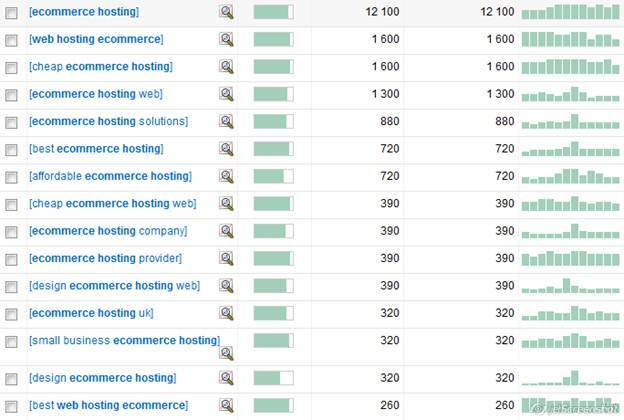 In fact, there are about 400-500 visits from the 8th– 9th place for a query “hosting” per month. It`s necessary to consider this and other points while planning hosting project promotion, because information about a large amount of queries in the Google AdWords Keyword Tool is “stuffed” with endless positions checks. As the market of hosting projects and domain name registrars is extremely competitive, you have a great chance to invest money, work and time in promotion of such queries that are stuffed and do not bring traffic and sales, and after all you can incur losses and even remain disappointed in the search promotion at all. The same can be said about domain name registration. In fact, there are about 500-600 visits from the 5th – 6th place for a query “domain” per month. That`s why, in our opinion, it`s better to begin promotion of hosting project or domain name registrar with finding active competitors in the search marketing niche and define their strategies. For this purpose we can recommend a wonderful tool – SemRush. Now we need to make cleaning, i.e., remove irrelevant sites from the list. In this case, obviously, Wikipedia must be removed from the list. After checking a few queries important for you in the same way, we will receive a “crossed” list of sites. 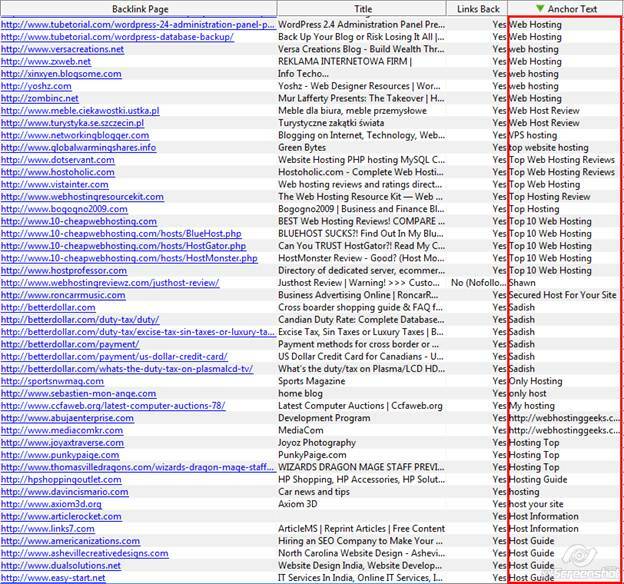 Sites from this list have good rankings for many queries in this subject, so they should be examined primarily. The example shows that, firstly, the number of search queries for which the site “hostgator” is shown has an explicit trend to growth. It reflects the efforts made by the owners of this project to increase its visibility in search engines. 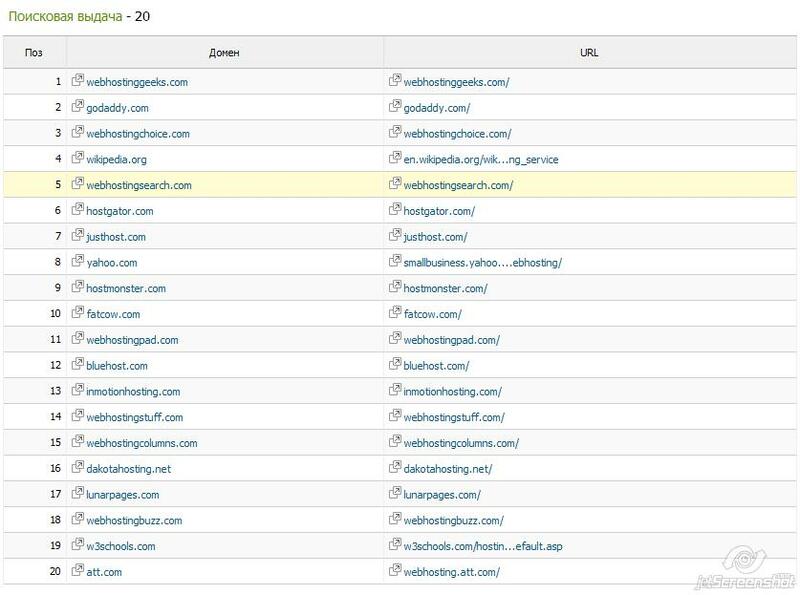 After selection of queries that bring maximum traffic to the project according to SemRush, we get an approximate keywords list which can be used to start promotion. Making the list of necessary keywords, let’s see whether it is a good idea for us to «meddle into a fight» for these keywords. You should consider such factor, as SEO-pressure, for this purpose. Features of keywords selection in the conditions of SEO-pressure. You can use different tools to estimate a competition for the selected query. A plug-in for FireFox called SeoQuake is one of convenient free instruments. We can see that the trends of search don’t show any sudden jumps or drops. The target audience for these queries is in the U.S. and UK – the most creditworthy regions in general. However, traffic for such query from the American Google Top5 – Top6 is about 1-3 persons a day, with natural drops on weekends; it gives us about 40 people a month. A conversion rate for these queries is extremely low. Of course, promotion for this queries is acceptable only with the purposes of improving positioning and brand awareness, but as for sales it isn`t effective. At the same time the great part of traffic and transactions comes from the U.S. and UK users despite of the fact that the site holds comparable positions also in Google.co.in. All of these patterns are also true for domain name registrars. It isn`t possibleto know this information without experience in promoting a site for such queries or without trying PPC advertising in exact match. 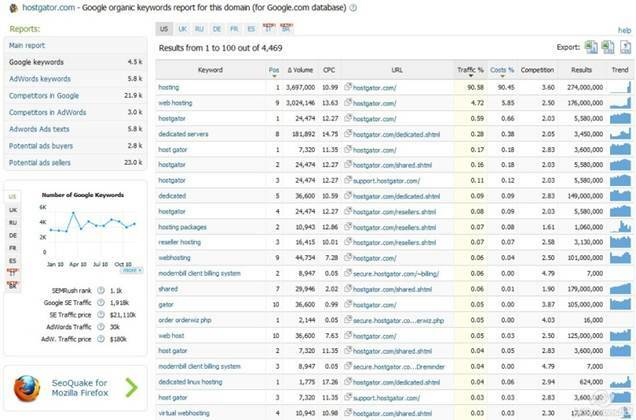 There are a lot of keywords like these, so you should constantly monitor all queries in the aggregate estimating of the effectiveness of each one. You can also “pull out” perspective keywords making the analysis of the backlinks text anchor to sites of competitors who are actively engaged in search marketing. You can use special tools, for example, CS Yazzle or SEO SpyGlass by LinkAssistant, either manually using Yahoo! Site Explorer. 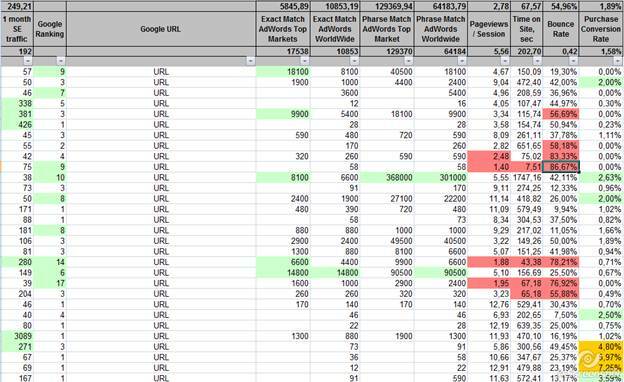 To estimate a real traffic on a query you may also try PPC in exact match. Microsoft Excel counts a parity of all these factors with the help of formulas and allows realizing efficiency/inefficiency of each keyword visually. Perspective traffic, quantity of searches per month (data of Google AdwordsKeywordTool) and conversion data for each query are marked with green color. Indicators exceeded the average indicators for the site to the worse are marked with red (bounce rate, number of pages reviews).The percent of conversion which vastly differs to better from the average indicator for the site is marked with yellow color in the last column (Conversion rate). Using this technique allows tracking the most convertible requests and receiving greater outcome from a client’s site. Based on our experience in promotion of projects in the niche of hosting and domain names registration we can say that the most high-frequency, convertible and competitive queries are in these topics exactly. 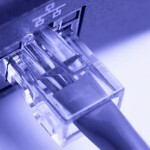 If to compare an earning power of dedicated servers sale (VPS) and earning power of shared hosting sale you will come to the conclusion that in general virtual (Shared) hosting sale is more profitable: one dedicated server sale brings around 200$ of income, at the same time sale of the same server “cutted” on virtual (Shared) hosting allows to earn much more (~100×5$), even with the consideration of the increasing load on a support. However, traffic in Shared hosting subtopic is much less than in dedicated server subtopic. People interested in such things, according to our observations, come by queries like “cheap hosting”, “cheap web hosting”, and the quantity of such searches is very small because Godaddy and Hostgator take away the lion’s share of these customers, mainly due to type-in traffic. In this case, it seems to be a good decision to perform promotion in the VPS and Dedicated sector. Many companies, apparently, have come to the same conclusion: promotion for queries of “shared” group is much easier, than for queries related to dedicated servers. As we have noted above, low-frequency traffic brings rather small part in general traffic and conversion; therefore, in our opinion, it`s better to begin promotion for high-frequency keywords with addition low – and mid-frequency keywords, which give a great bulk of sales and target traffic on a site. However, if your hosting site sells “exotic ” types of hosting, such as hosting with support of Zen Cart or Django, then such low-frequency, long-tail keywords can justify themself at the initial stages of promotion. A cost of their promotion to the Top-10 is small, and similar “exotic hosting” is usually searched by people who understand the subject well and thus type long queries in search bars. Eventually, when the site starts to rank well for competitive queries, it makes sense to “collect” low-frequency “long tail” of queries in subjects, not to miss this small piece of the market. – adding backlinks with correct “anchors” (with right reference texts). 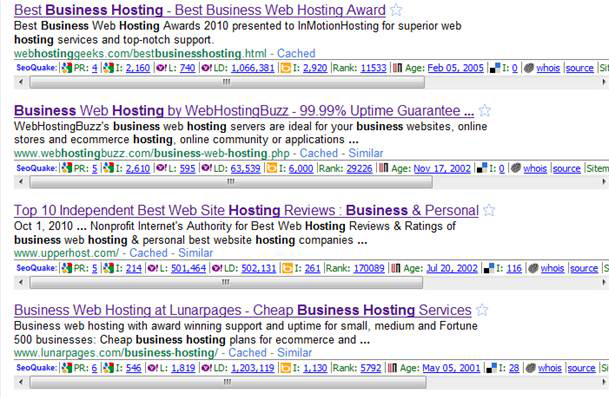 As we have already noted, hosting sites have a large number of backlinks. How do they receive so many backlinks? This is obvious, that reviews and comments at forums will never help to collect tens thousands of links. Four main methods used in this theme should be picked out. Some of them are typical for other niches and some of them have unusual “boom” exactly in hosting and domain subjects. — Link exchange. It is widely used for getting backlink mass for sites in every niche; as a rule it is a one-way link exchange for hosting topic, when a link required by the partner is placed not to a project`s site, but to a third-party site often created for link exchange. Usually links-managers from India are employed for this purpose, but this way is long and inefficient, as such links are often placed on «link farms». ­— Links purchase at various stocks. It is also a widespread method of backlinks increasing. This method is really effective because the number of getting links for a certain time is limited only by budget. 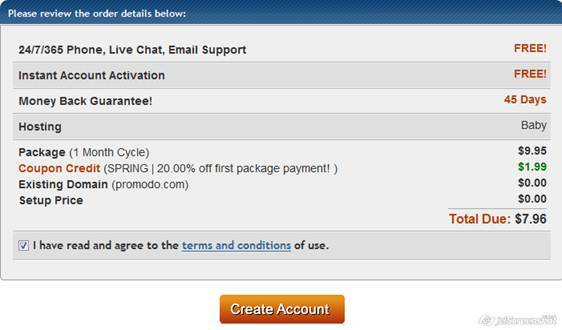 Backlinks purchase can be with a monthly payment or one-time purchase of “lifelong links” (usually from blogs). — Getting links through its own affiliate program. Almost all sites of these subjects have an affiliate program, after registering in which a visitor gets a unique referral link more often on the front page with some modifier. Registered referral can place different banners on his web site which are links to a site of the hosting or domain company. However many hosting sites underestimate this kind of getting links and set 302 redirect to the main page of a site from such referral links, thus losing links weight from these natural sources. If you change the type of redirect to 301, a link weight will not be lost. Also, do not forget to include a correct “alt” and “title” attributes for these banners. Thus, you can receive a life-long link with a correct anchor. — Link purchase in footers of free WordPress themes. According to our observations, a significant part of a links mass on sites of similar subjects was received from these sources. After the link is placed to the footer of a theme it runs on sites that specialize in collecting such topics. It is also a good way if you are able to hire your own web designer, who will design such topics and share them on specialized forums. The disadvantage of this method is that it is fine only for the promotion of high-frequency queries, as ROI will be too low after including low-frequency queries to the footer. The cost of these links is quite high, but it is your investment in the future. Traditionally it is considered that the USA and countries of Western Europe have the most solvent audience, however, we will pay attention to Oceania which takes the first places in both subjects. Probably, it makes sense to think about business expansion to these countries with a creation of regional domains. Besides hosting queries well converted in Oceania are also well converted in America and Africa. Typical problems that interfere sites conversion and ways of their solution. We can distinguish some common typical problems interfering conversion. – Problems with “usability” as a funnel of transitions after clicking the button “Add to Basket” (Buy Now, Order, Sign Up). We talked about typical errors during selection of queries earlier. However, I should note that informational queries also can bring sales, though not in such quantities as commercial or general queries. Queries that begin with words “how to” may be considered as such queries. As for pricing policy it must be competitive. So you should not be lazy to make a table with prices and services of competitors. Maybe it`s not a good idea to promote your site for queries, prices of which for some reason you are not able to hold at the level of competitors. One of the major problems is usability in a sales funnel on such sites. Management systems of third-party clients (for example, WHMCS) are often used on hosting sites. Sales funnels there do not meet any requirements as for usability. Up to 90 % of the visitors who have clicked the button «Add in a basket» get lost in a sales funnel! The first step. Variants are perfectly visually parted. The second step. 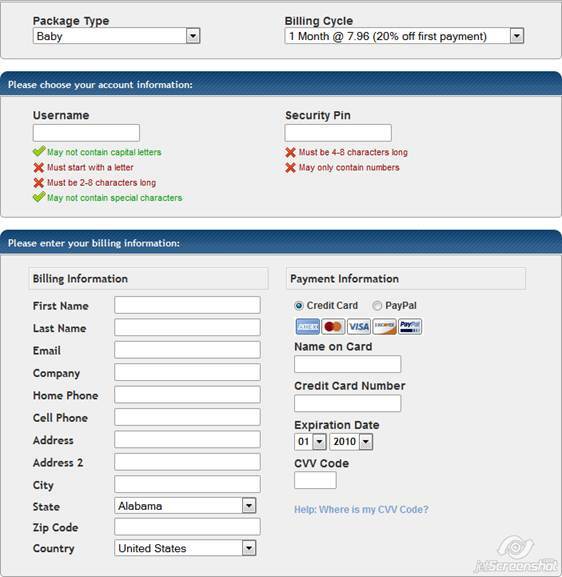 The forms are also separated visually; information about payment presents at once and is well visible. The information about a total sum of payment is visible below. Summing up, we can confirm: the promotion of a hosting company or domain registrar is possible, despite the high competition in these subjects. By overcoming typical mistakes and problems mentioned in this report, we believe that your business will succeed.